Addenbrooke’s Abroad to Cambridge Global Health Partnerships – celebrating 10 years of activity. 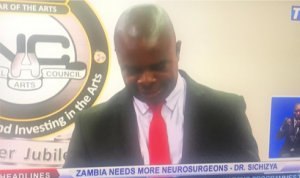 A report on the first National Zambian Neurotrauma Course and a survey of variations of skills and resources available for neurotrauma care nationwide – excerpts. Traumatic brain injury (TBI) and spinal cord injury (SCI) are significant and often underappreciated threats to public health worldwide. Injuries are estimated to be responsible for approximately 5 million deaths per year worldwide, 9% of all mortality (1), greater than deaths from HIV, malaria and tuberculosis combined. 89% of injury-related deaths occur in low-and-middle income countries (LMICs) (1)– rapid urbanisation and a lack of appropriate road safety measures in LMICs mean these figures are set to increase dramatically in the coming years. TBI accounts for a significant proportion of these deaths – estimates suggest one third of all injury-related mortality (2). It is estimated that 74% of Zambia’s surgical needs are not being met (3). Neurosurgical services are particularly sparse – there are only 2 fully trained neurosurgeons in the country (based in Lusaka). A significant proportion of emergency surgery for neurotrauma is therefore carried out by non-neurosurgeons, often general surgeons. As such, it is essential to ensure adequate training is delivered to these individuals to ensure that underserved rural communities have access to the same quality neurotrauma care that is available in urban centres such as Lusaka. 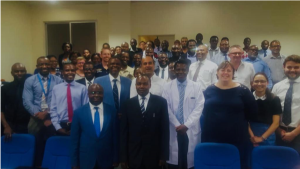 The NIHR GHRGN designed and delivered a national neurotrauma course in Zambia in January 2019. 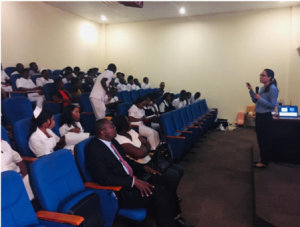 The course consisted of 2 days of lectures followed by practical work in the ED, intensive care unit, operating theatre or wards depending on the profession of the course candidate. The taught portion of the course consisted of lectures on the pathophysiology, pre-hospital, emergency department and intensive care management of TBI and SCI. Lectures on the use and interpretation of plain films, CT and MRI in neurotrauma were also delivered. Specific sessions on surgical technique were part of the programme, including lectures on 3D neuroanatomy pertinent to neurotrauma management. 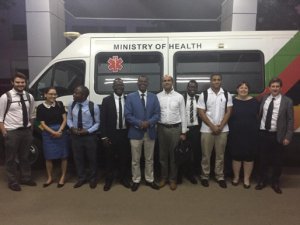 In addition, lectures on the current state of surgery, trauma, neurosurgery, intensive care and anaesthesia/perioperative care were delivered by prominent figures working in these areas in Zambia to provide the necessary context for the course. In the practical portion of the course, surgical candidates attended the neurosurgical operating theatre and were taught basic surgical skills for the management of neurotrauma including raising a trauma flap, creating burr holes with a Hudson brace (manual drill), elevating a free bone flap with a Gigli wire, safely performing a durotomy and basic principles of intracranial haemostasis. Physician candidates engaged on work in ED, the ICU and on the wards. In parallel to the practical sessions for doctors, a separate ‘Introduction to Clinical Neurosciences Nursing’ half-day course was run (led by a specialist neurosurgical nurse practitioner). 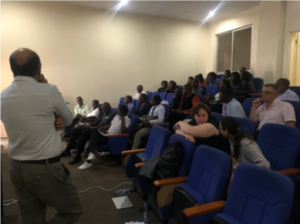 In addition to the taught aspect, the course acted as a platform for discussion of the barriers to the delivery of quality neurotrauma care in Zambia. Local clinicians presented their experience of managing neurotrauma in the pre-hospital, ED, ICU and operating theatre settings to their colleagues and senior figures in government hospitals and the Ministry of Health, prompting discussion of the key issues. Finally, the course and its message were featured on the Zambian national news on Tuesday 22nd January. CDC. Traumatic Brain Injury in the United States: A report to congress. USA; 1999. Esquivel MM, Uribe-Leitz T, Makasa E, Lishimpi K, Mwaba P, Bowman K, et al. Mapping Disparities in Access to Safe, Timely, and Essential Surgical Care in Zambia. JAMA Surg. 2016;151(11):1064-9.